Marbella Pizza Kitchen is located on Av del Prado, in Nueva Andalucia, Marbella (next to Open Cor). The place is easy to find as it boasts eye-catching advertising signs and quality design. The environment at Marbella Pizza Kitchen is very pleasant, whereas in the evenings, the place is purely romantic. In the background, you will always hear modern international pop music. The furniture is comfortable, and the chairs, light and cosy. The personnel is friendly and always eager to help, the service, quick and appropriate. 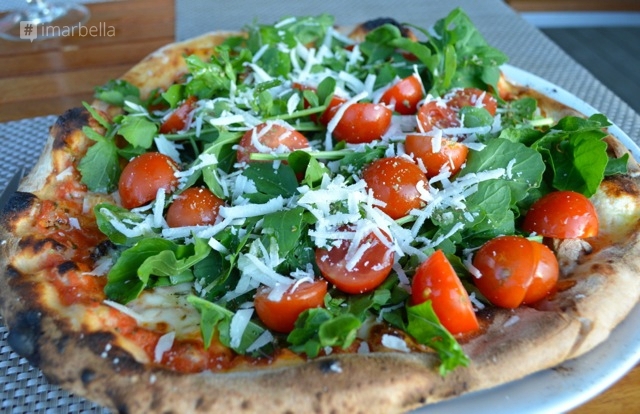 In addition to pizzas, the menu offers meals, salads, desserts, as well as a selection of wines and beverages. 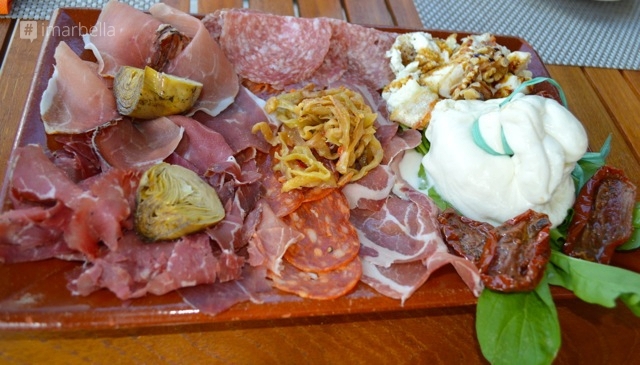 We ordered mixed antipasti with burrato and foccaccio il padrino. Laroza Rijoha was the wine of our choice. Naturally, children had water. The appetisers were really good and served in a beautiful manner. We then ordered Mozzarella salad with tomatoes and olives, lasagne, cannelloni with spinach, salad with melon and ruccola, and a selection of bruschettas. The salad with melon was actually served inside a melon, which was very unusual, and the salad itself, juicy and delicious. The lasagne was finger-licking! Of the pizzas on the menu, we ordered Veneto, Puglia, Base Blanca, and Inferno, which was spicy. Pizzas were also very good; the bottoms were not thick. The toppings were rich and smooth. The pizzas were good to eat both with hands and using knives and forks. For dessert, we tried a pizza with Nutella and banana as well as tiramisu. Tiramisu was prepared on the spot, and it was the tastiest Tiramisu I have ever had in my life! Those who love Tiramisu dearly simply must visit Marbella Pizza Kitchen. It is said that Italy is the land of pizza, and if you want a real pizza, you should go to Italy. But why go to Italy if there is Marbella Pizza Kitchen?